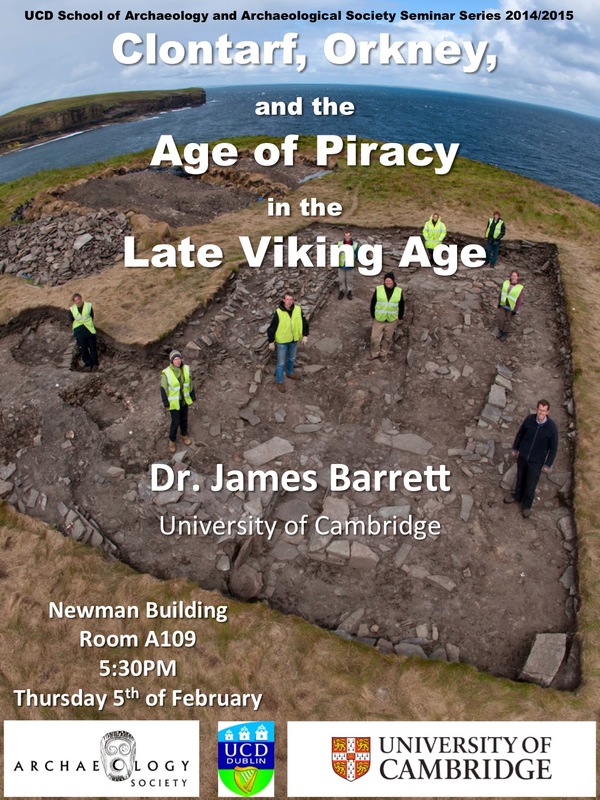 UCD Archaeological Society : Seminar report: "Clontarf, Orkney and the Age of Piracy in the Late Viking Age"
Seminar report: "Clontarf, Orkney and the Age of Piracy in the Late Viking Age"
On the 5th of February 2015, the UCD Archaeology Society welcomed Dr. James Barrett, from the Institute of Archaeological Research at the University of Cambridge. His presentation was titled, ‘Clontarf, Orkney and the Power of Piracy in the Late Viking Age’. Dr. Barrett began his presentation to us, by speaking of the first known record we have of the Earldom of Orkney, which was that of Earl Sigurd, evident in the Annals of Ulster. He posed the questions around which his seminar would be based. Was the Earldom of Orkney comparatively wealthy and powerful? What implications do the answers have to wider economic patterns in the Irish and North Seas between 900 AD and 1200? The Earldom of Orkney included north mainland Scotland and Shetland. He gave a brief example of wealth and power from Orkney by speaking about the Burry Hoard from c977-1010. At the time there was no actual coinage in Orkney, so it is widely believed that silver arm rings which were discovered, were used as the main standard unit of exchange. The rest of his seminar was focused around these points and ideas with particular reference to the two main sites in which he had a part in excavating. These were Quoygrew and The Brough of Deerness. Quoygrew was an Island of Westray while The Brough of Deerness was a tidal island and a Chieftain stronghold. He spoke of the economic boom, which took place at Quoygrew in the 11th and 12th Century. This boom was a feature of all parts of their economy, including agricultural, pastural and marine. There was large scale evidence of fish bones, mostly cod, dating back to the 11th and 12th century. There is evidence of an increase in dairying from this time, with a focus on the culling of neonatal calves. This is evident from the discovery of the bones of new born calves dating back to a period between the 10th and 12th centuries. There is also evidence at Quoygrew of the production and exportation of butter. Butter is believed to have served many purposes at the time, including for fat and for industrial purposes such as a lubricant for wheels. There is also evidence at this site of imported material culture, most of which has come from Norway. This is evident in the discoveries of steatite vessels, hones and combs. This develops the idea that trade links had been established between the Northern Worlds. Dr. Barrett discovered that the inhabitants of Quoygrew at the time tended to use vessels instead of ceramics. He spoke of evidence where pirates associated with Orkney decided to leave and seek employment in Norway in an attempt at rebellion. This led to the Earl going to Norway the following year to submit to the kings’ rule, in an attempt to maintain his position. Following this submission Shetland was taken away from the Earls rule, royal officials were put in several estates of the Earldom. When speaking of the Brough of Deerness, he gave a brief description of its characteristics and layout. It was a tidal island with 30 buildings. One of these buildings was a chapel. The layout suggests that it was processional in its plan, with two front buildings and a long walkway towards the rest of the settlement. This layout is believed to be one of the reasons why history has interpreted the Brough of Deerness as a monastic site. This interpretation also comes from the discovery of both a church and beehive like huts in the same settlement. The houses in the settlement were three aisled houses and pit houses, well structured with four posts. The settlement itself was a defensive one, set up facing eastwards so as they could spot all approaching threats. Dr. Barrett spoke of the Brough of Deerness possessing evidence of several different examples of material culture, all imported, from Norway, the Baltic and Irish Seas and from Anglo Saxon settlements. A major problem with these discoveries is that it is very hard to date them, as the settlement was built on top of a promontory fort. This has resulted in findings from both settlements making it difficult to differentiate between the two. One example Dr. Barrett used to show the trade between the Northern Isles and the Irish Isles was in the 10th century where Irish pins on Norwegian graves were replaced by local copies. In the 11th and 12 centuries however we see a change in trade patterns between these two Isles. Irish trade oriented to Chester, Bristol and France, while Norwegian trade became local and to both Scottish and English Ports.